With this four day itinerary for San Francisco, you will get the chance to see as much as possible during your stay. It starts with visits to top attractions such as the Golden Gate Bridge and Alcatraz. It continues with visits to Chinatown and North Beach. 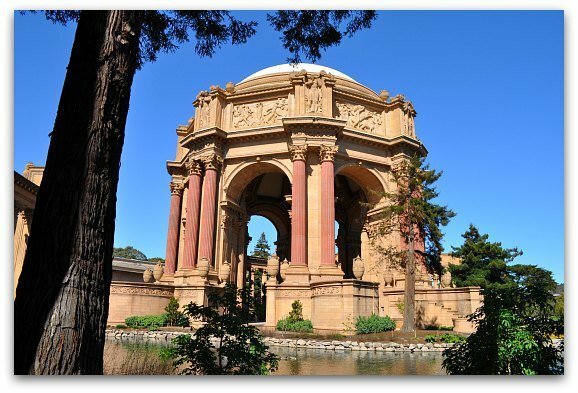 During your first four days, you will also head over to Golden Gate Park for a look inside the California Academy of Sciences, the Japanese Tea Garden, and the Conservatory of Flowers. In addition, this self-guided tour includes stops at the colorful murals in the Mission and the oldest building in SF. On day four, you will head over to the Asian Art Museum, visit City Hall, and admire the Pained Ladies of Alamo Square. Day one starts with a walk across the iconic San Francisco Golden Gate Bridge. This beauty is on the northern side of SF and is easy to access via car or public transit. After your visit, you will head down to the waterfront for a stroll along Crissy Field and a chance to admire the Palace of Fine Arts. Your day continues with a bus ride over to Fisherman's Wharf for lunch and some time to explore this popular district. Your next big adventure on day one is a ferry ride over to Alcatraz Island for their night tour. Click here for more details on the day one itinerary. On day two, you will visit the North Beach and Chinatown Districts. 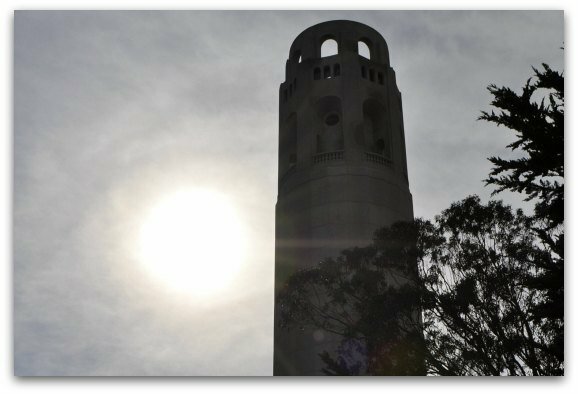 They include a stop at one of Diego Rivera's famous frescos, the Coit Tower's observatory tower, and tips on where to find other murals in North Beach. You will then stroll over to Chinatown to see some of its historic temples, shop for inexpensive goods, and sample dim sum. Click here for additional information and pictures for day two. Your journey continues on day three with a visit to Golden Gate Park. You will start your day by visiting the California Academy of Sciences. It offers four museums in one location with a four-story rainforest, a natural history museum, a planetarium, and an aquarium. You will also find fun activities, a rare white allegator, and a chance to feel what's it's like to be in an earthquake. You will then visit one of three living museums. 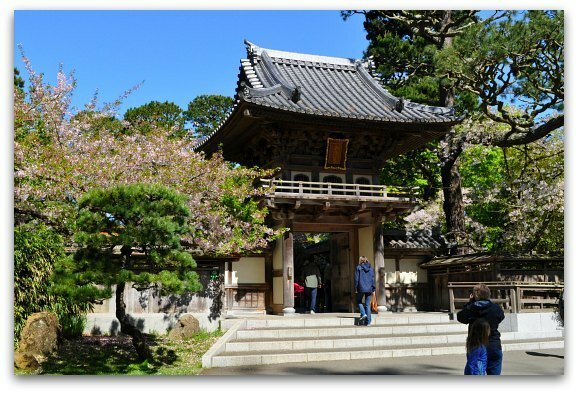 You have the option to visit the Botanical Gardens, the Japanese Tea Garden, or the Conservatory of Flowers. All three are a wonderful experience and take about an hour. You will then head over to the Mission District where you will see the oldest building in SF, as well as some of the most colorful murals in the city. Click here for additional details on day three. On day four, you will head over to the Civic Center District to visit one of my favorite museums and see the beauty of City Hall. You will then walk to Hayes Valley for a late lunch and visit the Painted Ladies of Alamo Square. The best days to follow day four are Tuesday - Friday. This is when you will find everything on this list open to the public. Your day starts at 10am with a visit to the Asian Art Museum. 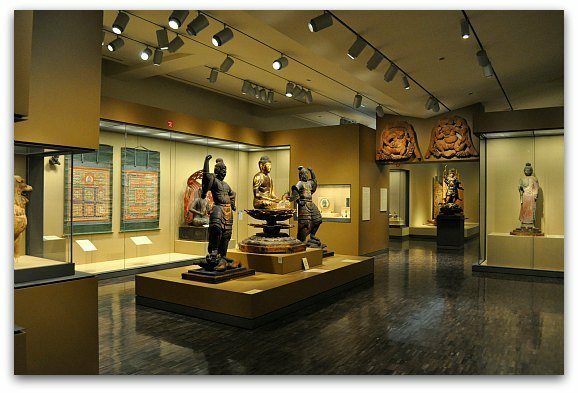 It houses an amazing collection of Asian art from countries such as China, Korea, and Japan. You will also find a large collection of pieces from Indonesia, Malaysia, and India. The pieces in their permanent exhibits were created over the span of around 6,000 years. They also attract some of the best traveling exhibits with pieces from Asian. There is an additional fee to visit these collections, but they are usually worth it. Click here to learn more about what it's like to visit the Asian Art Museum. City Hall is beautiful both inside and out. It's one of SF's top free attractions. It's open to the public during standard business hours Monday - Friday between 8am and 8pm. Inside, you will get the chance to take a look inside its beautiful dome, see their gorgeous marble staircase, and visit two small exhibits. The first is on the main floor and offers a look at pieces of history from City Hall. The second exhibit is on the lower level. It's a rotating collection of photos of people, places, and events in SF's history. 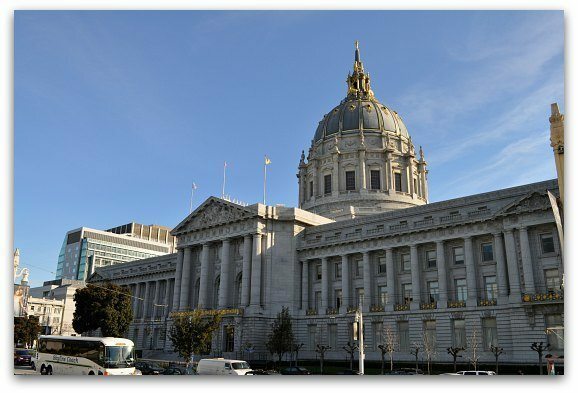 Click here to learn more about what it's like to visit SF's City Hall. When you are done in City Hall, I recommend heading over to the Hayes Valley area for lunch. You will find several options. My favorites are Souvla (Greek, 517 Hayes, moderate price), Lunchpad (Sandwiches/Comfort Food, 581 Hayes, moderate price), or Papito Hayes (Mexican, 425 Hayes, moderate price). After lunch, you can either walk up the hill to Alamo Square or take the 21 bus that picks up at Laguna and Hayes. Painted ladies are any historic Victorian or Edwardian house painted in three or more colors. You will find them throughout this district. The most famous set are located on Steiner Street at Hayes across from Alamo Square Park. They are six houses with the same structure, but in slightly different colors. There is also one additional beauty on the end of the row. 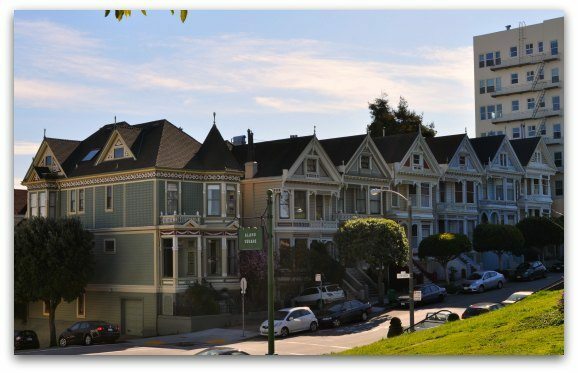 They are often called the "Seven Sisters of Alamo Square" or "Postcard Row." The sun shines on them in the afternoon and its the best time to visit and/or take photos. Once you are done here, stroll around the district for additional colorful gems all around the park. Click here for additional pictures and maps on where you will find other painted ladies in this district. Depending on how long you walked around the park and the district, it might be time for a cocktail or beverage. You will find several high-end options along Divisadero Street. You can grab a quick drink or, if you are hungry, find a wonderful place for dinner. There are several ways to save on your stay in SF. Here are my top recommendations. Goldstar: This is where you will find dozens of discounted tickets on everything from tours to theater productions. Most tickets sell for around 50% off the full ticket price + a small service fee. In the end, you will save a lot by checking out their great deals. Click here to view their selection of tickets for your stay. Their deals are for events, tours, and activities about two to three months out, so check back again if you don't find anything for the dates you are staying in SF. TripAdvisor: You will also find great deals for hotels on TripAdvisor. This site offers deals such as discounts on room rates, free wifi, and breakfast in bed. Click here to search for the best prices for your stay. LivingSocial: Another great place to find deals is on LivingSocial. You will find deals for tours, nightlife events, and local services such as massages, spa treatments, etc. They usually offer a limited number of tickets/discounts for a specified period of time. You can save a lot by using their site. Click here to see what offers are available today!